Young actors Theo Taplitz and Michael Barbieri add heart and a bit of soul to the independent feature "Little Men." They meet, and immediately bond when Theo moves to Brooklyn. Theo's father (played by Greg Kinnear) has inherited his father's apartment, a building that includes a ground floor dress shop rented by Michael's mother (played by Paulina Garcia.) Spurred on by his sister, who co-owns the property, Kinnear insists on raising Garcia's rent. This demand generates great tension, as we watch the young boy's friendship grow. "Little Men" showcases fine performances, especially from the boys and from Paulina Garcia, who quietly (even passive aggressively) argues against the rent increase with Kinnear. 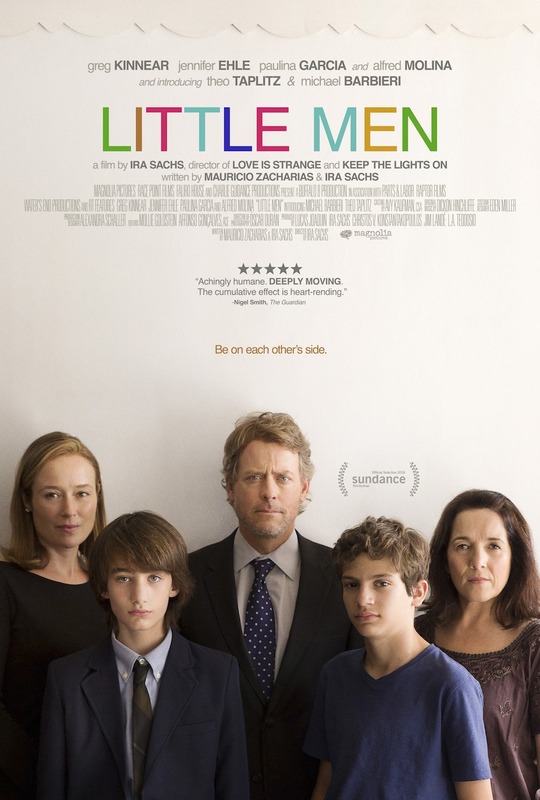 "Little Men" serves a sliver of life that cuts deep. 3 stars. Does it deliver what it promises? Touching family drama. Is it entertaining? Great acting. Is it worth the price of admission? An independent gem.